I’ve seen other people make versions of this recipe — I got the original idea a couple of years ago from watching the Food Network, so it’s hardly my invention. I do give myself credit for thinking to pair the avocado dipping sauce with the salmon fingers, though. 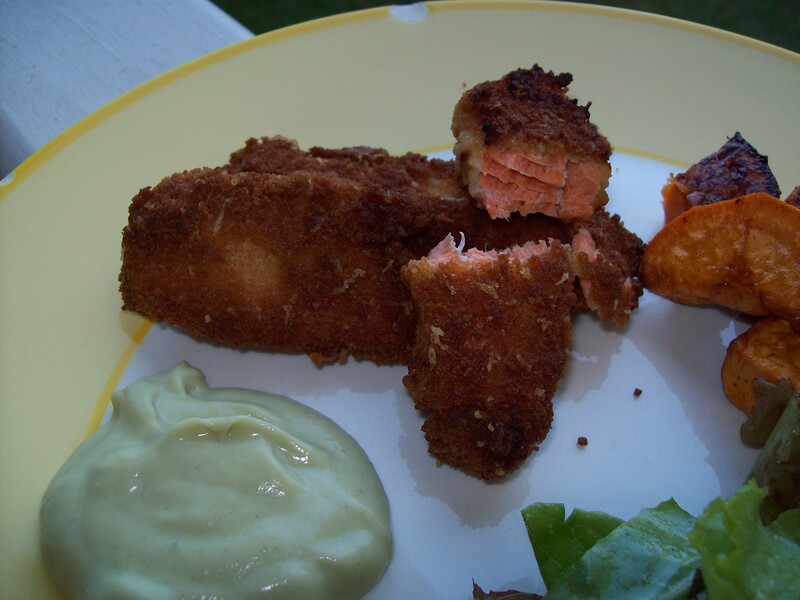 So, with a nod to all the other salmon-finger-loving cooks out there, this is my version of a great, healthy twist on fish sticks. Preheat oven to 400 degrees. Spray a baking sheet lightly with cooking spray or rub with olive oil. Cut the salmon into “fingers,” roughly 1/2 inch thick by 2-3 inches long. Combine the flour with a pinch of salt and pepper. Lightly coat the salmon fingers in the seasoned flour — this will help the eggs and breading stick to the fish. Pat off any excess flour, then dip the fish fingers in the beaten egg, roll in the breading mixture, and place on the baking sheet. Bake the salmon fingers at 400 degrees for about 15 minutes, just until golden brown and cooked through. Serve with the avocado dip. Combine all the ingredients, tossing well to make sure the cheese doesn’t clump up and fall to the bottom of the breading. Scoop the flesh out of the avocadoes and place in a blender or food processor with the remaining ingredients. Puree until smooth and creamy. This dip is great on almost anything you can think of, but I think it pairs especially well with the crunchy salmon.